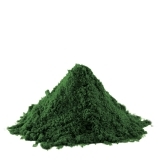 Does daily supplementation with spirulina make you just as fit as a daily workout? Frequently we write about studies we have our reservations about, but usually we keep those concerns for ourselves. Opinions are cheap, especially in the internet era. We prefer to invest our energy in information. But in the case of the study into the effects of exercise and spirulina on the fat mass and fitness that Mexican researchers published in Marine Drugs, we make an exception to that rule. This study can not be correct. Every day a few pills of spirulina just as effective - and perhaps even more effectively - als a daily intensive workout of one hour? Ce n'est pas possible, monsieur. The researchers divided several dozen fat men into 4 groups. For 6 weeks a group did nothing at all. This was the control group. A second group took a placebo every day for 6 weeks, and did a cardio workout of an hour 5 times a week. The men trained 3 times a week with an intensity of 50-80 percent of their maximal oxygen uptake [VO2max], and did interval training twice a week with an intensity of 80-90 percent of their VO2max. A third group took 4.5 grams of Spirulina maxima every day. The producer of the supplement used did not sponsor the study. A fourth group trained and used spirulina. When the 6 weeks were over, the researchers waited for 2 weeks, and then repeated the procedure. The subjects who had taken a placebo now received spirulina - and vice versa. The researchers started their study with 52 test subjects, and ended their study with 52 test subjects. [Figure] Hm... A study in which 52 fat subjects have to work out for one hour a day, 5 days a week, for 12 weeks, without one of them dropping out of the study. That's suspicious impressive. Before and after the 6 weeks, the men passed an exercise test until exhaustion. According to the study, [below left] spirulina prolonged the time until the subjects were exhausted [time to fatigue] - and the training program did not. Both training and spirulina supplementation increased VO2max [below right]. There is a trend that supplementation and training reinforce each other's effects, but this trend is not statistically significant. The training program caused fat loss, and therefore weight loss. There was a trend that supplementation enlarged these effects, but it was not statistically significant. "Spirulina maxima supplementation synergistically improves the effects of systematic exercise on body composition and cardiorespiratory fitness parameters ", summarize the researchers. Mar Drugs. 2018 Oct 1;16(10). Endurance athletes and sprinters may be able to increase their oxygen uptake capacity by taking a couple of grams of Chlorella daily. 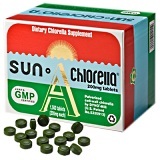 Sponsored or not, we now have a lot of human studies that show that supplementation with Chlorella is interesting for athletes.